Stevie Nicks, a singer-songwriter best known for her work with Fleetwood Mac, said, "I am pretty fearless, and you know why? Because I don't handle fear very well; I'm not a good terrified person." Some declarers experience nervousness when the dummy comes down. They play far too quickly, not giving the contract proper consideration. In this week's columns, though, we will not be handling fear. Instead, we will be trying to play the trump suit itself correctly. In this deal, South is in four hearts. 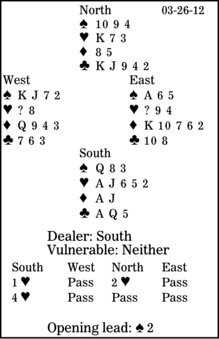 West leads a low spade. East wins with his ace and returns the six, the higher of two remaining cards. West takes his jack, cashes the king, and shifts to a low diamond. What should declarer do after taking East's king with his ace? South's four hearts was an overbid. Maybe he should have rebid two no-trump. Then, perhaps, North would have continued with three clubs (although that might have been read as showing at least a six-card suit), and four hearts would have been reached. South's diamond loser can be discarded on dummy's clubs. But trumps must be drawn first. After leading a heart to dummy's king, should declarer play a heart to his jack or to his ace? No doubt you have heard of "eight ever, nine never." This suit is the first half of that. With eight cards, finesse against the queen; do not try to drop it doubleton offside. South needs hearts to be 3-2, and the queen will be in the three-card holding 60 percent of the time and in the two-card holding only 40 percent. Taking the finesse is much better than playing for the drop.